When tsunami volunteer Niyarm Chivawattansukul, a carpenter from Narathiwat, approached Ban Tub Tawan to help in a housing project in February, his original plan was to make ordinary house to replace those destroyed by the disaster. Each of the 47 has an individual wood-carved balustrade, made from a range of motifs - lotus, sunflower, jasmine, parsley, rose and star. It's not just unfinished work that keeps him from leaving. The carpenter said he has developed strong ties with people in the village. Bonus: A well-written insightful Council on International Educational Exchange student-written report on post-tsunami issues, including the "land grab" and housing issues I keep hearing about again and again. (Found by Googling "Four Regions Slum Network"). p.s. There are countless complaints about the hastily built Army housing (as well as many multinational NGO's housing projects) all over the coast: "Those the government built did not pay heed to our our feelings [desires and needs] and our way of life", says Panya Ananthakul, head of Tok Pu community in another Bangkok Post article. But the Four Regions Slum Network (I cannot find a website), where the artistic Mr Niyarm (above) volunteers, is a rare exception that works along with local communities. I've seen this organization lauded more than once. I really liked this story in the December 26, 2005 Bangkok Post, it jibes with Graeme Bristol's comment: "Economic recovery goes a long, long way towards psychological recovery." In the story, a fisherman recounts how he lost his sister and nephew to the tsunami. Another depressed nephew took his own life after. "Woodwork helps me from thinking about the tsunami tragedy." It'd take too long now to spell out but I've been finding that throwing cash at people hasn't been particularly effective. As the head of Ban Nam Khem village says that without a fair distribution system "generosity can be a two-edged sword if one villager gets money but the others don't." In other words, resentment builds and divides the community. I've verified this myself in other villages. I think too that the Asian "face-saving" pride plays a role. And universally people like to feel self-sufficient. So I every afternoon I ate lunch at Pa's restaurant, the Rim Tang on Koh Jum, or I stopped to buy longan and oranges at Lan's shop (first on the left on your way to Koh Jum village). Or on Phi Phi I might buy a banana shake from a street vendor, a T-shirt from another, a flashlight from a third, a taxiboat ride from the boy. Suthee Chumphol, a fisherman from Ban Nam Khem [approximately 1800 of their 5000-strong fishing community perished], admits he used to be clumsy with wood and carpenter's tools. But today he owns a fishing boat that he made on his own. Unlike other aid agencies, which tend to provide free donations, Save Andaman wanted its recepients to acquire new skills. The fishermen shouldered half of the boat's cost, about 75,000 baht, while the other half was paid by other companies joining the project including Dow Chemical, Toyota, Siam Cement Group, and the Stock Exchange of Thailand. The fisherman's share of the cost, which will be made gradually once they can earn an income, will go to a community fund which will be used for other development activities. The fisherman can take out loans from the fund to buy the necessary fishing equipment. In order to manage the fund properly and develop it into a community bank, the fishermen learned basic accountancy and audit work. The group plans to make 50 boats this year. All are small-sized boats, measuring 10 metres in length. The cooperative did not stop at boat building. The novice carpenters started to produce beams and other woodwork to supply a new housing project. p.s. The December 26th issue of Bangkok Post is excellent. Unfortunately, they archive their articles in an impossible to find manner. If anyone can help me, please let me know. p.p.s. I'd already heard complimentary things about Save Andaman before this story. Nearly half the staff of Maprao Resort - where I am staying now and was last year - fled from the island after the tsunami. The ones who stayed do not look out to sea just ten meters ahead and revisit the horrors of the past. Alex and Gem from the U.K. were also guests at Maprao last year and they came back both as a profound 'thank you' to the staff that selflessly saved, kept watch for follow-on waves and looters, and fed them for days as well as "to banish any demons." With resort owners Guy and Marie-Pia on a 9 a.m. ferry to Phuket, Tan was in charge December 26, 2004. He noted that what had started as a postcard-perfect day was shifting. The sea in front of the restaurant was churning and getting darker in hue. He saw the water recede - he indicates a rock in the bay as we talk - and quickly surmised that what goes out must come back. Tan yelled for the guests to get off the beach. A staff member's child, Nai, was mesmerized by the hopping fish exposed in the wide expanse of white sand and was about to rush out to grab one when Tan herded everyone to high ground. The pattern I see emerging between the people that are thriving today and those that got caught up in depression, suicide, attempted murder, domestic violence and other conflict isn't random. When the rubber met the road, they applied their philosophy of life to the situation without a second thought. In the context of Tan's life (I got the abbreviated version of his life story) what he did before, during, and after the tsunami was natural. As a boy he climbed coconuts, worked on fishing boats from 5 p.m. to 7 a.m., and toiled in rubber plantations to help his family with income. The tsunami wasn't his first challenge. "What will be, will be," says Tan when we first begin chatting. "You must keep your mind strong. If you cannot control yourself, you cannot help others." Walking into town the day after tsunami for food for his guests, he was forced to walk over bodies. Living on the compact island for twenty-one years, he had many friends that lost their lives among the 2005 casualties (2005, or 2007, is the number I hear many locals quote). In the aftermath, he became a monk for two months. It was something he'd always wanted to do and now, "it was the right time". He joined the temple monks in touring and praying in devastated areas such as Phi Phi and Khao Lak following the disaster. As we sit at the bamboo table, Tan says, "If you do good, you have good." He takes the back of his palm - the one that was injured in a near-fatal truck accident ten years ago - and strikes it against the edge of the table so it rebounds. "If you do bad, you get bad." With that karmic gesture I can see how he conceived that a bay that quickly recedes must come back with a vengeance. When he first saw the planes slamming into the twin towers on television he believed he was watching an action movie. Later, "I learn it was true." He doesn't understand how anyone can believe that killing others will lead them to paradise. "Paradise is inside," he pats his chest, "in the heart." And patting his crown, "And hell is in the mind." An ebony-winged butterfly flutters past. He says that if he is tired or upset he cannot see its beauty, and another time the same butterfly brings him joy. So what is the difference? His mind. He acknowleges that this is all: "Easy to speak, hard to make." But he's pretty clever. For instance, since one can't think clearly while embroiled in anger, he's asked his seven-year-old daughter to call him on it when she spots that he's strayed from calm-headedness. His employer Guy says Tan is like a son to him. "In eighteen years, you see someone under a lot of situations where they are tested. Tan has never had a cross word with me. When we disagree we discuss it. When we need to leave Maprao, I never worry." p.s. This post doesn't even begin to do justice to our conversation... When I get back home I'll write a longer piece that weaves in Tan's life. The photo is of Tan with his daughter. I briefly met Bazuki the other day at the Christmas Day ceremonies with the twenty-one Buddhist forest monks. He and Ed both work for Reuters, and they are among the very few journalists and photographers I've been impressed with. He doesn't simply take a few shots for ten minutes and move on. He absorbs the entire day. I run into him this morning at an Internet cafe and comment on the photos I see on the laptop screen. "They're intimate, and close up." They decided to come to Phi Phi rather than bigger Phuket or Khao Lak as they wagered the feel here would be "less formal, more private and personal as they'd be among their own people." With the prime minister in attendance and the grand staged events in harder-hit Khao Lak there was the possibility for reserve. His photography is suffused with the essence of his philosophy: "I like real people, not politics." He switched from architecture to photojournalism because it "felt right." "I missed the click of the camera when I was doing architecture, but I never missed drawing when I was photographing." One day he speaks to a governor and the next day a Vietnam Vet. It's talking to people from all walks of life that is a bonus. I replied how many people at home feel reluctant to tell me to "have a good time" since this isn't a "holiday." However I enjoy talking to people this year much more than laying on the beach last year. Sometimes words fail us. His photos speaks volumes. p.s. As an LSU graduate in Baton Rouge, he loves the New Orleans area. Being based in Kuala Lumpur he wasn't top of Reuters list to cover Katrina. Hmmm, these are exactly the kind of situations that the artisan journalism microfund is intended for. Photos from yesterday and today's "One Year in Memory of Tsunami" ceremonies on Phi Phi Island, Thailand, which a Bangkok Post reporter tells me was this country's hardest hit island. It's nearly midnight now and December 26th is coming to a close. It's hard to explain ... but it really feels right to be back here one year later. A few more of my photos are over at Flickr. I spend an inordinate time at the press center organized by PhiPhi26community.com today uploading photos. From this vantage point at the Phi Phi Inn, which was also generously converted into a temporary medical center earlier this year until the official clinic was up to speed, I peer above the booth set up for The Children of Phi Phi. "Do you work with Children of Phi Phi?" I ask the farung volunteer. He volunteered when he arrived on Phi Phi recently. But he didn't want to just mill around the beach on holiday he implies. He was fortunate enough to be in Europe when the tsunami hit, but his girlfriend actually was on Phi Phi (unscathed) and witnessed the devastation first-hand. Ralph at HiPhiPhi via email tells me that over 3500 foreign volunteers paid their own way and individually pitched in with local community. This area has been HAND cleared many times by local community members and international volunteers. We leave this here today as a reminder of what a few helping hands can do in one day. This is the way the entire Island has been cleaned, by all the helping hands working together. We're reminded this evening as families gather around scooped out sand laying candles in the burrowed beach from the volunteer behind on stage that the day's ceremony was hosted by the local community, "not the government." And she asks for volunteers to help with clean-up tomorrow at 11 a.m. The two children look up. A face-painted clown twists a green balloon into a dog and places it by dozen or so family members seated around one of the blazing memorials in the sand. At the press center computer during dusk, I'm interrupted by the squeals. Kids with balloons. Many of them orange (I overhear: "besides condoms, these were the only kind I could find"). In the midst of it, I spot the same European volunteer I bought the t-shirt from. He carries a giddy Thai girl around the umbrella stand laden with hanging T-shirts. We stood for a minute of silence at 10:15 a.m. this morning. Later after the deputy prime minster has spoken, we file towards the bay. A six or seven-year old blond girl with a white sundress gently bows and places her palms into a triangular wai. She lays a white orchid given to each surviving family member at the ceremony by the altar ledge fringed with flowers, photos, incense sticks and remembrances circling the banyan tree wrapped in rainbow colored sashes. Her mother stands behind with the jeweled bay stark in the background. Today is December 26th, 2005 one year to the date that millions of people along the Indian Ocean coast were swept off their feet. Hundreds of thousands perished. For the last week, I have been effectively retracing my steps from last year this time. My "holiday" effectively ended at around 10:15 a.m. near Loh Moo Dee Bay on Phi Phi Island this time last year. I have walked all over the island. Except to that exact Loh Moo Dee beach even though it is around the corner from where I am staying. "The return of smiles," a freelance Japanese writer and photographer on his tenth visit to Thailand tells me "isn't really news." A Reuters reporter tells me that it's bad news that's considered news fodder. The smiles don't mean work here is done. I ask Frederick Jurriaanse of the organization Phi Phi Aid when he sees his work on Phi Phi complete. He shrugs, "I have no idea. There are people living on the mainland [in camps] that I want to help come back." As an ex-high school principal in the U.K, he is departing January 25th to speak to schools from primary to university levels to talk about recovery efforts throughout the UK. At sunset yesterday I was bouyant watching Thais and farung light fiery thigh-high paper latterns. One by one they drift up into the air and trail into a stream of giant fireflies in the languid air. Floating up to heaven. The ceremony isn't ceremonious. The symbolic release that the traditional latterns represent has the atmosphere of out-and-out, well, play. "In Thai, the word understanding means coming from the heart. One of our teachers says to understand suffering means to stand under suffering. It's the journey from the head to the heart. After suffering and impermanence you start to look for the 'owner' of the suffering. And you begin to travel with really light luggage. Instead of a dam, we become a river." But today, I am much sadder than I anticipated. Traveling with a tinge of heavy gear. Most people are as reserved as they were the first few hours after the tsunami itself. When no one spoke more than necessary. Only a few people openly weep in front of the banyan tree. I walk along the beach strip. Only one hundred meters wide. The trees on this stretch were obliterated. Everywhere new palm plantings are supported upright by wooden stakes. Flanked by bays on both sides, this strip bore the brunt of the twin waves. A cotillian of longtail boats festooned with waving flags arrive from neighboring Koh Lanta island. In procession they wade through the shallow waters of the back bay bearing baby coconut palms. Gifts to plant today together with the people of Phi Phi. Seeing them, I'm reminded of that recent day when schoolteacher Reena at neighbor island Koh Jum instructs her 7-year-old kids: "Tree", "Ton mai". "Tree", "Ton Mai," they repeat. They were beaming. And the little seedlings they'd planted in transparent dixie cups were too. I pass by a booth today selling books and T-shirts. 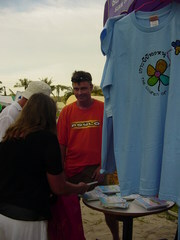 A child from the beach-front school has hand colored the stick figure flower crayon red on the front of the T-shirt. I especially like that she didn't stay within the lines. On the back, she's stylistically drawn the narrow strip of beach book-ended by the two bays. 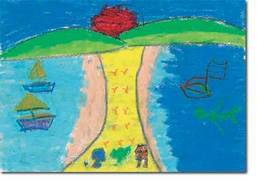 In her drawing, the sea is tranquil as usual. It's a precise rendition of where we stand this morning in remembrance. It remains to me one of the most beautiful places in the world regardless of December 26th, 2004.
p.s. So I buy the shirt. It's to support the local school primarily and in the future, educational initiatives at the school for the parents to learn English and business skills such as producing the handpainted T-shirts themselves. 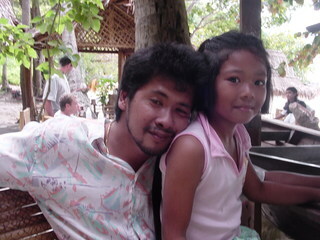 See The Children of Phi Phi Island. The picture above is similar in style to one on my shirt. p.p.s. It's World Remembrance Week, today through January 1st. For me, it's remembrance straight through to February 20th when I return back to the states. I wake in the morning and peek through the mosquito netting and straight through the wide slats in the bamboo hut. My line of sight ahead is above the rooftop terrace bungalows where guests slept alfresco on the evening of December 27th while Tan stood on watch all night long. In case everyone needed to spend another night in the jungle hills. At dusk tonight, I walk through the shantytown of Ton Sai village and on to the brunt of tsunami damage on the island. Construction reigns in this concentrated area and the views of both bays are still unobstructed by villas or lodges. Signs read: Return to Paradise. I'm now back at the gracious and friendly Maprao bungalows where I stayed last December 25th (and intended to stay December 26th instead of Vachira Phuket Hospital). I talk with Richard - not his ordained name - the "rebel monk." Richard's known as the "rebel monk" way before the Chinese guest ("I don't own a TV") whom works for a HDTV manufacturer in Phoenix is aghast to find him sitting in Maprao in his saffron robes and casually smoking a cigarette. Richard spent three years meditating in a Penang, Malaysia cave with "cobras and pit vipers for company". We talk about the tsunami, karma and giving. He tells me of gathering food donations for the Malaysian tsunami-struck coast last year. "Imagine that, I have a Hindu friend deliver Buddhist donations to a Muslim village." "The next moment is uncertain. Now is the effect of the last moment and is the cause of the next, so Now is the most important moment." And were you to call Richard on his cellphone his voice mail says more or less: "There is no you to call, no me to answer...only one never-ending series of cause and effect." Richard is meditating more and more intensely each day leading up to the tsunami anniversary. It also happens to be the two-year anniversary of his own mother's death. I walk over to the HiPhiPhi volunteer shed looking for volunteer coordinator La and see that tomorrow a group of international monks are coming with a northeast Thailand forest monastery contingent. They are here for an public all-day metta meditation and dharma Q&A on hehalf of the victims and surviving family members. That is where you will find me on Christmas Day. It's Christmas Eve as I write. For an island renowned for its hedonistic Spring Break style parties, the mood is subdued tonight although decidedly not down. And I have been amazed by the realness and richness of my conversations here the last two days. I will have been in Thailand one week - that is after 1 a.m. technically - and I've learned more than I expected for a month. I'm still digesting and allowing the patterns to emerge in order to share this in a cohesive manner with you. But until after the 26th, I'm taking a page from Guy, the owner of Maprao whom was interviewed by the Belgian TV station, RTBF today. (Actually I was too.) He squarely put the focus on remembrance and respect of people rather than on the complexities and controversies of disaster relief and response. On Christmas Day and Boxing Day, if you are so inclined, I invite you to spend a brief moment in silence and radical stillness for all the disaster victims of the past twelve months across all the world. Hug your loved ones and enjoy each moment of your holidays. Signing off from gorgeous and remarkable Phi Phi, Thailand. In Krabi I picked up Time Asia, six of the sixteen Best Photos of 2005 were of disaster (including shots from the Indian Ocean tsunami, Katrina, and the Pakistan/India earthquake). Time quotes Susan Sontag: "Narrative can make us understand," she wrote. "Photographs do something else; they haunt us." There are plenty of haunting pictures and stories of the tsunami. But the thing about photos is they are static. What happens after the photo I wonder? "I don't even remember exactly what happened anymore," says Phil, the Scot who lives at Woodlawn Lodge and is part-owner of Ao Si bungalows with the head schoolteacher Reena (I misspelled it in previous post). Phil tends to clip his sentences as if I'm supposed to finish them. And surprisingly I can. He actually says more in his pauses, the way his throat catches, the glistening in his eyes. I've seen so many snapshots and heard so many stories I don't know what to think anymore. In the last few days I've discussed things I'd never considered would be on the agenda: the mafia, domestic abuse, how money divides people, and the wistfulness of watching this island you want to preserve like a snapshot, change. I have had tinges of grief for all of it. As my teacher says, everyone wants to be reborn, yet ironically nothing wants to die. There are several entries in the Andaman Beach Resort's guestbook on December 25th. The next entry isn't until February 25th. Another in May 2005 reads: "I'm not the same Michael as was here in 2001." Phil is my last interviewee last night. Interviewee? The truth is I've simply been talking to people. They know I'm a writer, but I've only gotten one: "No comment." In the culmination as I hand Phil the change for my drink, he must note my glumness and offers: "Don't let it get you cynical." It's the first time I'm not talking about relief efforts, and I try to explain why I truly came back. "I'm not the same person as I was last year this time," I say. "I'm not the same person I was last year," Phil replies. The glistening eyes are moist at the tanned edges. "You read about people in earthquakes. Now you know." "Sometimes I come out here alone and sit. I look and I wonder," he says as I look straight ahead at the lapping shore imagining him sitting in the white plastic chair I just rose from. I'm not in control, echoes in my head as I walk along the beach strip in the dark between the coral rock shore and the forest edge on my way back to my room.